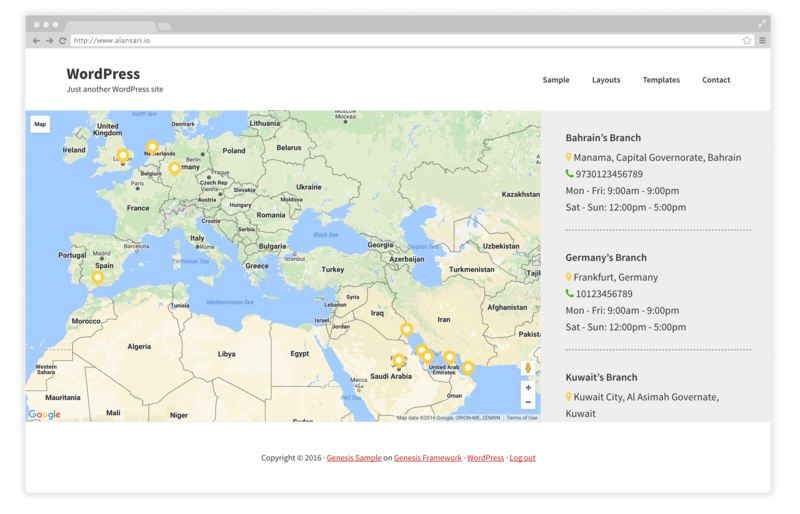 Creating a Google map with multiple markers is very handy for a site which requires showing various locations for their business. I have recently worked on a site where that was required and had to put something together. So I have decided to use Advanced Custom Fields along with a Custom Post Type to manage the entries. Here is the final look of what we are trying to achieve. The right column is a scrollable column. So you can add as many locations as you like and the list won’t break the design. It is also responsive so that the layout will change in smaller screens. When you click on any of the items on the right column, the info box will pop on the map to show you the location you have clicked. Ok so lets us jump into it. You need to create an API key with Google to be able to use the map on a live site. You can create your Google API following this link. I have done that before in previous tutorials, so I won’t be covering it here however if you want the easy way and just import the fields, just download them using the following link (Download Link). Create the page template to load the custom post type. Create the new page_locations.php file under your child theme folder and add the following code to it. Create a new file called map.js under the child theme subfolder /js, create the subfolder if it does not exist. Add the following code to the file. You will need to create your own marker and update the link in line 41. Here is a copy of the market I have used (Image link). Please ensure to also update the size of the marker in the same line. The value should be half the size of the image dimensions. This is to take care of retina displays. $('#listdata').append('<div class= "linkage" id="p'+index+'">'+$marker.html()+'</div>'); // change html here if you want but eave id intact!! 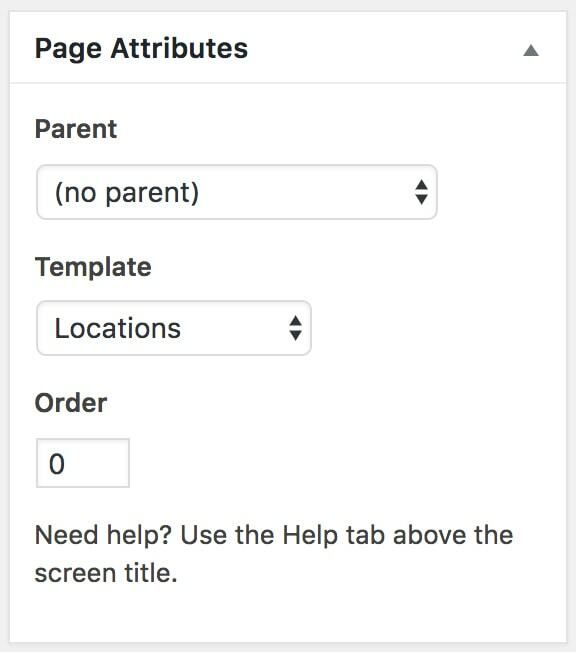 Create a new page and select the custom template we created (Locations). That should be it. Once you are done with the above, all you have to do is go to your admin dashboard and start adding your locations. As usual, if you found this to be useful, then please feel free to share it. I would be more than happy to help if you have any questions. So feel free to comment below. Thank your very much for this tutorial, it helped me undestand how it works, and i manage to make it work for posts in my home page.i’ll write a tutorial on this!! I am very thankful that this has been helpful. Very glad to be of help. I have used your code but I got an error. How can I solve that? A fatal error could be for multiple reasons. I won’t be able to help without seeing the code itself. Sorry about that. Hello Omar, in the code of the maps.js is listed only the cities that indicate on the map and if I wanted to show the state of each city in the side list and just link the cities on the map. I try to sort by category “state” but all cities appear in the same category, I can not separate. Would you help me? I am not able to follow you here. Can you be a bit more specific and point out to where exactly on the code are you having an issue.